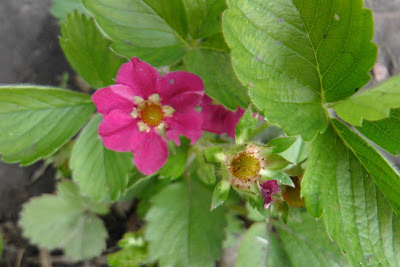 Ornamental strawberries are blooming. These are outside. Beautiful old-fashioned bleeding-heart (Lamprocapnos spectabilis). 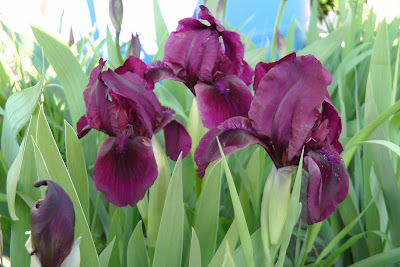 Iris, I love this color, and it is the first one that is blooming. Petunia is very much getting ready to bloom. 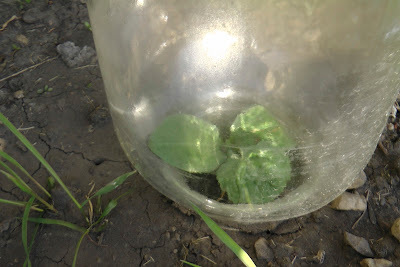 Zucchini happily growing in a jar. 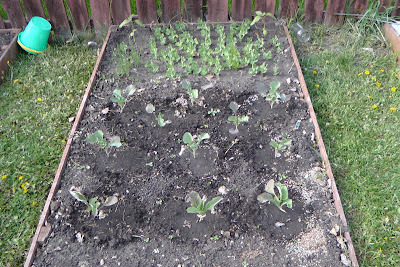 The Square foot garden with sunflowers in the back that are covered during cold nights, peas and some cabbage family plants that did not mind to get a little frost. 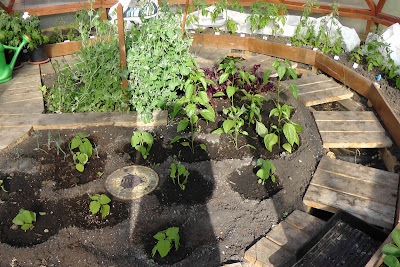 Ground cherries, peppers, and eggplant are growing in the middle part. 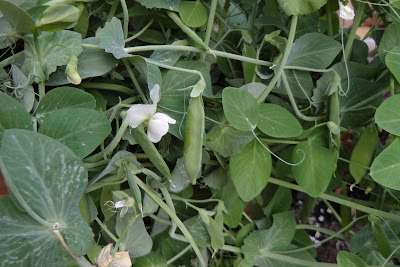 The peas that I started in early March are still there, along with the beets in between the peppers. 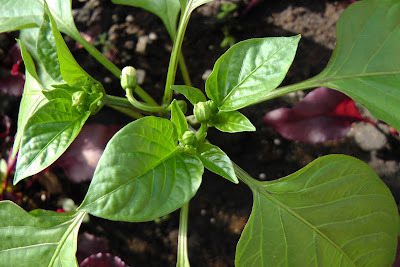 Pepper plants are wanting to bloom. We already eat the peas. 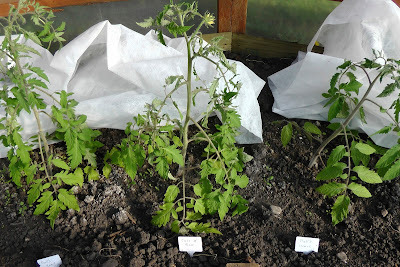 Tomato plants that I started in March are having lots of tomatoes. 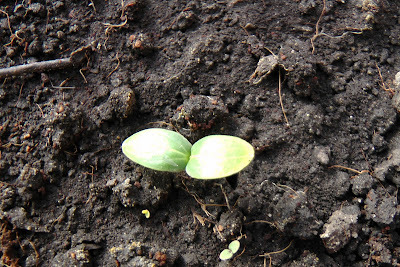 Cucumbers are just popping out of the ground. 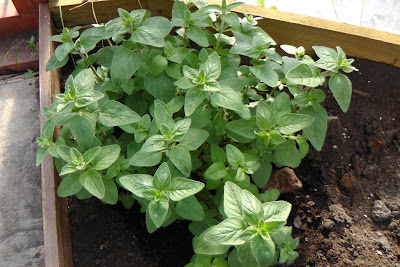 Oregano that overwintered is looking really good. 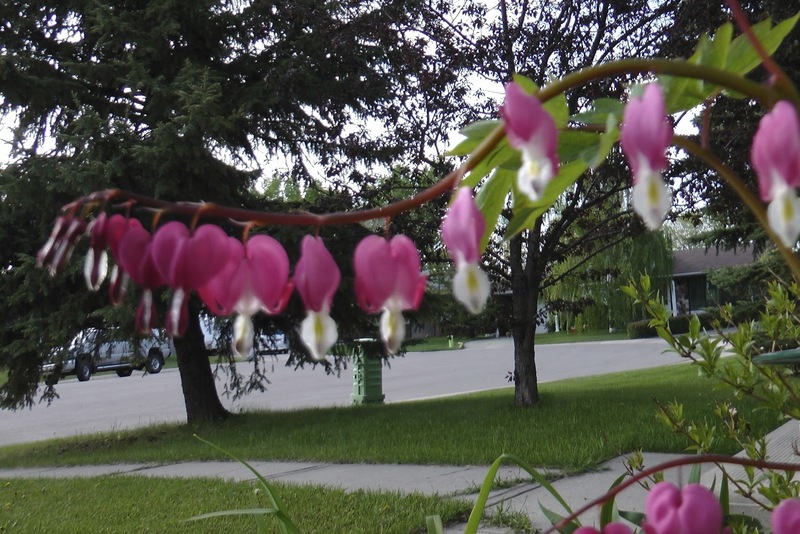 I also have a plant outside that also overwintered and looks good, too. So it does not have to be in the greenhouse. 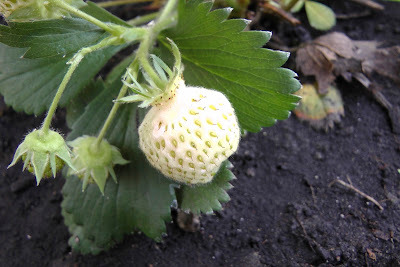 Strawberries in the greenhouse just need some color. Tomatoes that I transplanted into the ground about two weeks ago are blooming. 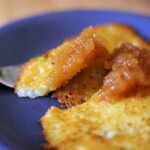 herzlich willkommen als neue Leserin auf meinem Blog. Wie hier blüht es bei dir in Kanada ganz wundervoll. Besonders beeindruckend finde ich das Iglu-Gewächshaus. Ein Gewächshaus in dieser Form habe ich bisher nicht gesehen. Thank you Anette! Yes, the greenhouse is very unique. It is nice to meet new gardeners! We are in Northern Wisconsin, Zone 3, Lat. N46 Long.90) with a growing season of about 76 days. 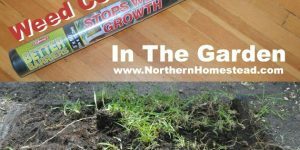 I have been looking for a blog with conditions similar to ours to get a sense of what is working for you, and my husband has an interest in the Paul Robinson style GeoDome. One of us must have seen a photo of your dome, and we are excited to find both our interests in one blog! 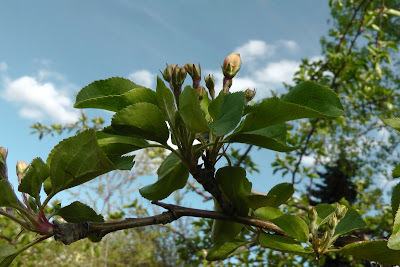 We have been on our homestead since 2011, have gardened every year and learned a lot, still working on annual surprises, and started up with a small flock of Barred Rock laying hens in Spring of 2017. 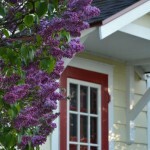 Your blog posts seem to be somewhat seasonal summaries. Do you have posts about your progress and long term experience with your dome? 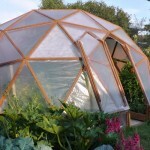 Would you recommend a GeoDome for use in Zone 3 with winter crops? We suspect a little heat may be necessary from time to time and after we complete a rocket mass heater for our cottage, my husband wants to design one for the dome (I think it will be a bit too hot, myself!) What have your dome challenges been? And my biggest question is what sort of housing structures have you found successful in keeping your flock over winter? 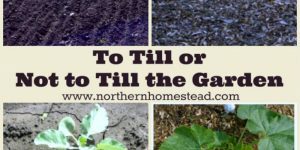 We followed advice that seem to have bee from a published “expert” who only knew about the Lower Midwest conditions and smaller hens than we have. Our flock grazes our property a few hours a day Spring through Fall, and keenly misses the fun and nutrients they get from bugs and pasture greens. All of us are keenly aware of the predator pressure typical of the marshy forested area we live in, so they have a well protected 80 sf enclosed run in addition to their coop, which we were told we did not need to insulate, but seemed to have been too cold, judging from the injuries, illness and mortality we experience in their first Winter. I quickly looked through your posts and have the impression that your dome was built before your blog was launched. 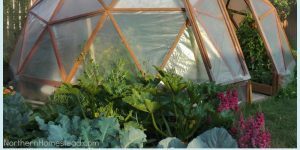 My husband Roger built a zip-tie style dome which is now almost finished, but feels the GeoDome will be much easier to build and maintain, is more elegant and may actual be more efficient in terms of cost, solar exposure and winter care. He is wondering if what you built is a two or a three frequency design? He has a few other questions. We are hoping you can comment on some or all of the questions we have and look forward to hearing from you! 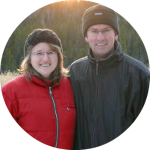 Hi Sandy, welcome to our blog. You do have a lot of question and most of them are answered in one post or another. This is our second Dome greenhouse. We love them and would always recommend them. 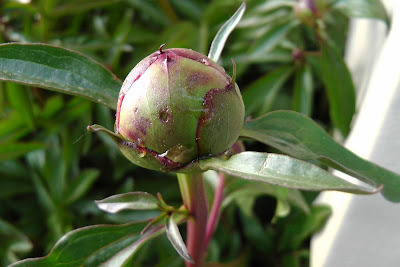 However, we do not grow in the dome during the winter. 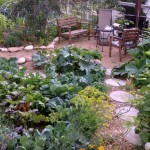 We find it easier and more practical to have a summer greenhouse and a winter indoor garden/greenhouse. 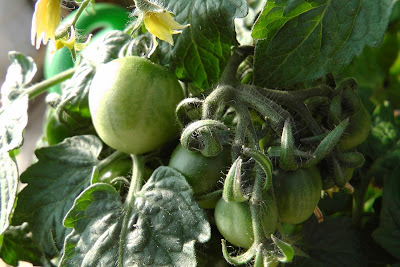 We plant out our summer tomatoes in the geodome in May and try to get them going as long as possible (October), and we plant the winter tomatoes in the indoor growing space in July and they produce till about February. So to have them both in one greenhouse would not work anyways. You will find all the growing related posts under Growing. 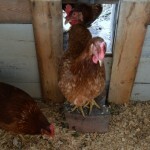 Chickens do need insulation in zone 3. We had ours in the same room where the indoor garden is. It worked well, since this way it was not just warm, but also bright. Again all of this and more is under Raising. The greenhouses and indoor garage/greenhouse are under Building. 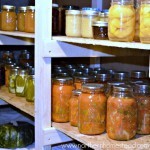 Hope you will find some interesting and helpful information.